Gulf Air’s comprehensive rebranding is designed to re-claim its position at the cutting edge of hospitality and technology, worthy of the airline’s status as the national carrier of Bahrain and the first airline to operate in the Middle East. Gulf Air launched in the early 1950s. The rebranding includes a sublime visual identity created by brand consultancy Saffron and impeccable aircraft interiors by design consultancy tangerine. Over the past two years, they have worked hand-in-hand with Gulf Air’s executive management and Board of Directors to review the details of color, texture and form resulting in seamless and a consistent quality at every brand touchpoint. The brand consultancy characterises the new Gulf Air brand as ‘smart with heart,’ and there is plenty of heart in it. 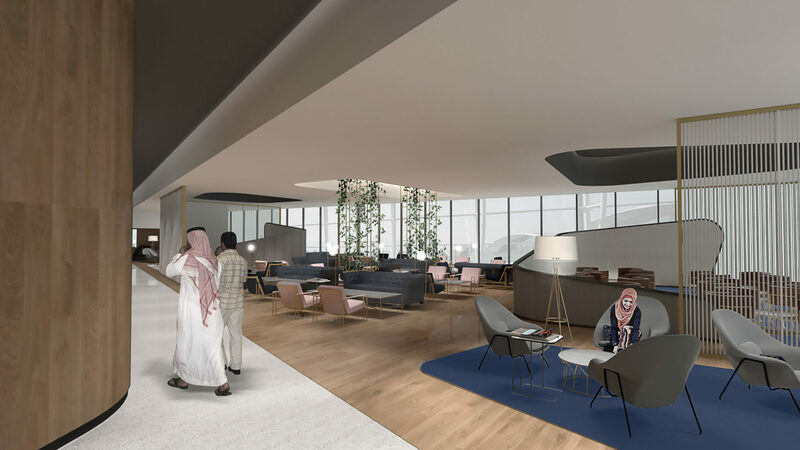 “We have created an experience for passengers that is both technology-led and welcoming – retaining Gulf Air’s renowned offering of Arabian hospitality.” Saffron CEO Jacob Benbunan said. Saffron’s Chief Creative Officer Gabor Schreier explained that the design team immersed itself in the culture of Bahrain and the history of the airline. “We have rediscovered the airline’s magic and captured it in a powerful visual language,” he said. That magic is embodied by the redesigned Gulf Air falcon. Saffron re-drew the brand’s icon with fuller curves and used negative space – the absence of color – to add dimension, texture and motion. The falcon also appears in the airline’s new font set, with serif points in the shape of the falcon’s beak, curves that follow the line of the falcon’s wings, and the same hashmarks that make up the falcon’s feathers adding dimension to letters. Combined with a brushed gold and a midnight-sky navy complementary color palette the effect is striking in its modernity. That aesthetic carries through to the airline’s lounge and to the aircraft interiors where tangerine and Saffron played with landscape, sky and natural elements to create a welcoming, comforting and very modern space. In the aircraft cabin, brown leathers that recall falconry gloves cover headrests, arm caps, and the footstool of the business class seat. 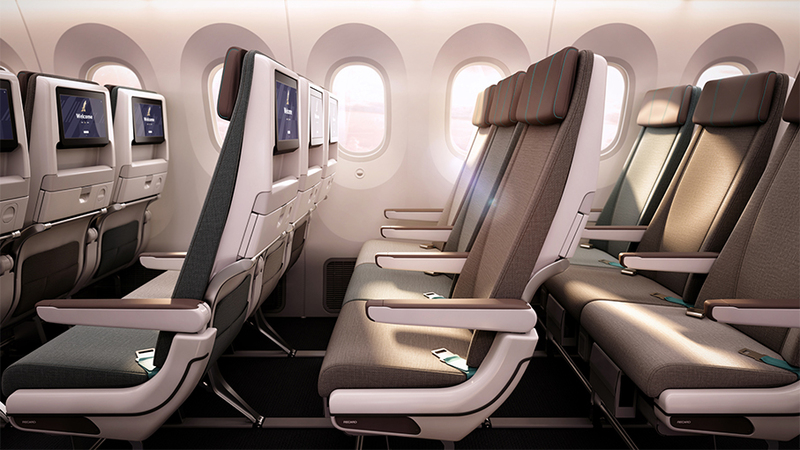 Tangerine worked with seating manufacturer Rockwell Collins to customise the new Serenity model. The falcon’s wings also appear on the business class curtains and in an iridescent pattern on bulkhead panels. The feathers’ hashmarks are abstracted in the print of soft-products including blankets and pillows. Natural tones evoking the landscape of Bahrain grace the economy cabin creating a soothing environment. Recaro CL3710 economy class seats offer passengers modern lifestyle elements including state-of-the-art Thales AVANT inflight entertainment system. “We curated the design carefully across multiple seating products and aircraft, including the B787, A320 and A321, to ensure that a cohesive brand and customer experience is established across every touchpoint of Gulf Air’s service,” Matt Round, tangerine Chief Creative Officer said of the project. The airline did not miss a beat, ensuring that its digital identity also follows the new brand standard at all touchpoints – a critical element of seamless branding. Gulf Air, Saffron and tangerine have chosen well and set the falcon free to conquer the skies.